Cape Town - The battle for Champions League places is still a "rat race" with eight games of the Premier League season left, Manchester United manager Louis van Gaal said on Friday. United have beaten Tottenham Hotspur and Liverpool in their last two games, producing their best form of the season to consolidate fourth place in the table, five points ahead of the chasing pack. They host Aston Villa on Saturday and, with matches against the top three sides to come before the end of the season, United cannot afford to drop points against a side who are 16th in the table, three points clear of the relegation zone. "The top four is still a rat race," Van Gaal told a news conference. "I said when we had 13 points from 11 games and we were getting a lot of criticism that we would see at the end of the season. We will still see at the end of the season. We still have the top three to play." Marouane Fellaini scored the winner for Belgium against Israel on Tuesday and has been an important player in United's recent resurgence following a difficult first season at Old Trafford. "I didn't meet him until after we came back from pre-season in the United States," Van Gaal said. "From the first training session he has done everything I have asked. He has been very open to what I have said and he wants to perform. 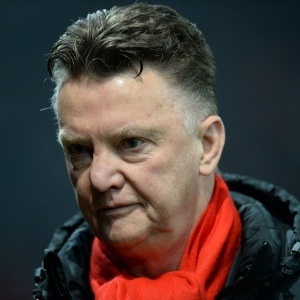 We can change the system but the way he is playing, I cannot change him," Van Gaal added. "He can give a lot of balance to the team." Defender Chris Smalling is doubtful after being substituted during England's friendly against Italy on Tuesday due to illness. Dutch striker Robin van Persie is still injured but England full back Luke Shaw is back in the squad.